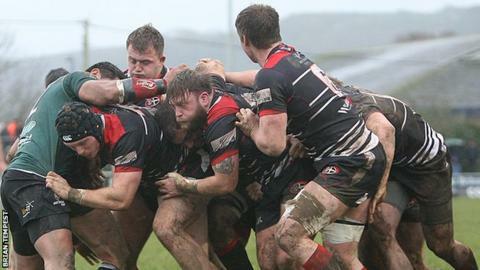 Cornish Pirates boss Ian Davies says his side's 38-19 win over Nottingham in the British and Irish Cup shows the depth he has in his squad. First-half tries from Tom Channon, Kyle Moyle, Tom Hendrickson, Marlen Walker and Alex Day ensured the Pirates had a bonus point before the break. Tom Duncan added a sixth in the second half despite them going down to 13 men for a time after two yellow cards. Pirates now face London Welsh next week with the winner topping the group. "We put a lot of focus on the cup, there's two trophies to win and it's one of them and the guys who came in took their chances," Davies told BBC Radio Cornwall. "Now we've got guys coming back from injury which makes training more competitive, which means you've got to work harder to hold onto your shirt. "You saw a few guys today, who haven't had a lot of rugby, put their hands up, Dan Lee, Sam Simmonds, people like that, I thought were quite outstanding. "It all makes for an interesting few weeks where guys being left out could probably walk into our side from the early part of the season and certainly last season."